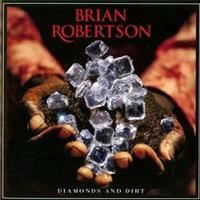 Brian Robertson is best known for his work with Thin Lizzy (and a very brief stint with Motorhead), and this is his first solo album. It really doesn’t sound like that band (with the exception of a few pieces – and actually this touches on a few cuts from Robertson’s time in Thin Lizzy), except that the sound also resides well within the realm of what is now called “classic rock.” This disc is quite a versatile set that never fails to entertain. This powers in hard rocking and tasty. It really feels like something from Aldo Nova, minus the keyboards. It’s got that kind of 1980s hook. There’s a lot of funk on this smoking hot classic rocker. It’s a killer tune. I really dig some of the guitar sounds on this, but the whole performance is exceptional. A hard rocker, this is perhaps closer to Thin Lizzy than the two openers (of course, the fact that Phil Lynott wrote it contributes to that), but it’s still not a huge stretch from the sound of those. This is definitely tied to the 1970s and 1980s. It’s a real scorcher. In fact, I’d consider this one of the highlights of the disc. This definitely has some extremely tasty guitar soloing. While this is more of the same, it doesn’t sound like the other pieces. In some ways, it’s one of the catchiest pieces on show. That’s because it’s more of a mainstream pop rock tune. For that reason it doesn’t work quite as well for this reviewer, but it has its charms. The tune was written by Frankie Miller (with whom Robertson also played). Bluesy, bouncy and tasty, this is a killer cut. It’s one of the highlights of the set. It really is more blues tune than rock song, but then again there’s plenty of common ground between the two genres. It is also another Lynott penned piece. Smoking hot guitar opens this. The tune rocks out like crazy. It’s like the previous number, but with more energy and landing further on the rock side than the blues. It’s perhaps a bit like Thin Lizzy. It’s also great. This powers in with a hard rocking introduction, but then turns to more of a ballad. It seems like a cross between The Allman Brothers and Thin Lizzy with perhaps a bit of vintage Bad Company added to the mix. We get some killer guitar soloing on this thing. Here’s another from Robertson’s time playing with Frankie Miller. While the guitar really dominates this, the vocal arrangement adds a lot, too. This thing is a scorching hot rocker with a lot of bluesy sounds on display. Interestingly, this is one of the cuts here that feels like it could have been done by Thin Lizzy. There is a cool instrumental section later that’s very proggy. The riff that opens this feels like old-school Grand Funk Railroad to me. It shifts more towards pure blues from there, but in a lot of ways this feels like ZZ Top quite a bit. It’s another great tune on an album that’s full of them. It’s another tune originally done by Thin Lizzy, this one written by Robertson and Lynott. Can you actually look at that title and not think of Porky Pig? Well, I sure can’t. The cut takes all of that from the mind, though. It starts with a short acoustic based introduction and then pounds out into a seriously hard rocking jam for a time. The acoustic returns with a more powered up sound further down the road. This is a hard edged classic rocker that’s sort of a powered up ballad. Thin Lizzy would certainly make the short list of influences here, but it’s more like Bad Company to my ear. Psychedelic sounds start this. Then it drops to a rocking sound with a spoken vocal verse that reminds me of Dire Straits. The final Lynott penned track on the set, this is extremely bluesy and tasty. It works out toward more blues rock as it continues, but overall it’s one of the most purely bluesy cuts on show. The disc is closed with another Frankie Miller tune. It’s a killer classic rock tune with a lot of blues in the mix. It’s a great way to end things in style. Bad Company is certainly a valid reference here.